Introducing new textures and flavors at the appropriate time is an important part of establishing lifelong healthy eating habits. 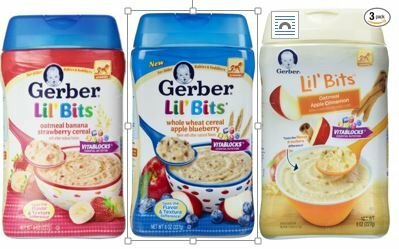 As your little one starts exploring new textures, try Gerber Lil' Bits Cereals - it has added texture and is made with real fruit. Gerber cereals with Vitablocks are a great source of iron and 10 essential vitamins and minerals. Snap lock closure means less mess for you! Crawler Stage. BPA Free packaging. This item is not a manufacturer-created variety pack and will not be sent in the original manufacturer's packaging.